Ancient Greece, Geometric Period, ca. 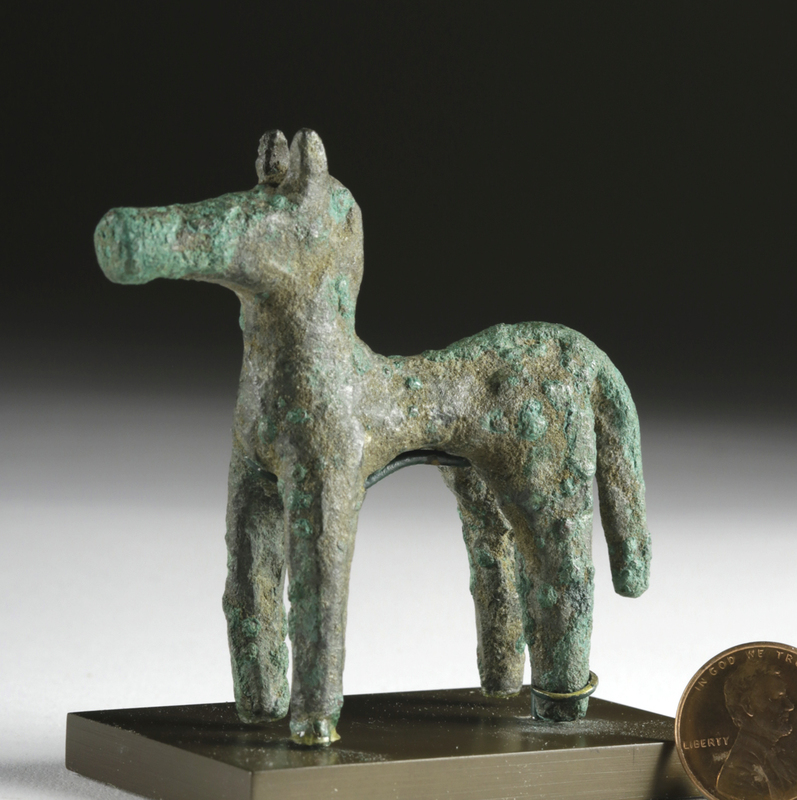 late 8th to 7th century BCE. 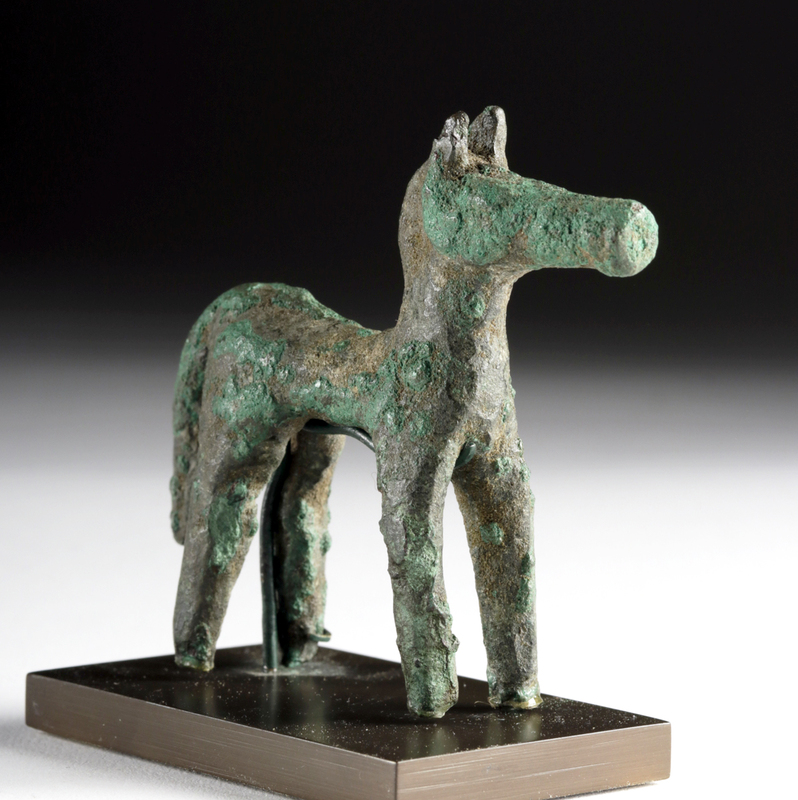 A fabulous cast-bronze horse presenting characteristically-abstract geometric-era stylization. The tubular animal widens slightly at the hips and tapers towards the chest, the body supported by four cylindrical legs, and a curved tail drooping down the middle of the haunches. 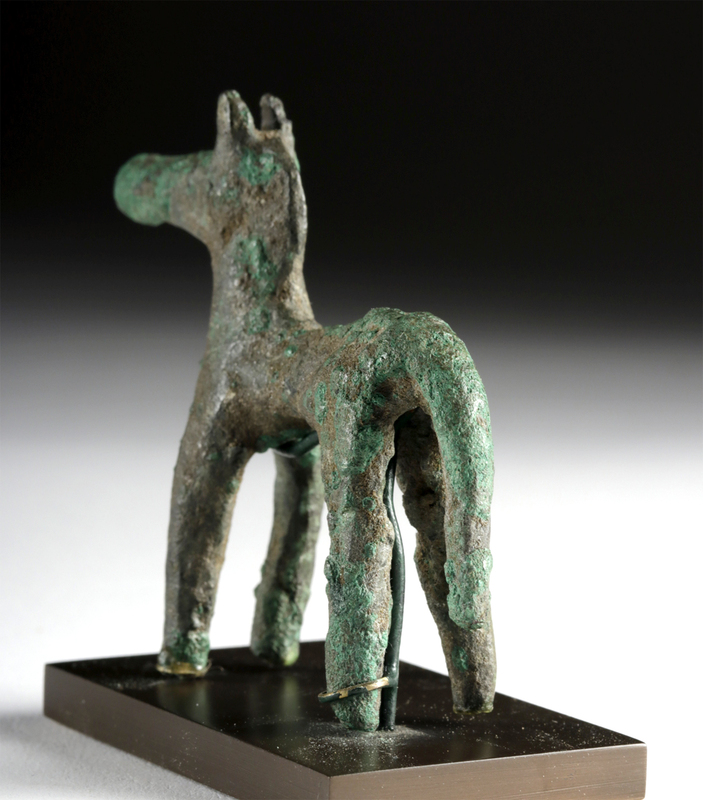 The proud head is raised in an attentive manner with a crested mane, a tapering ovoid snout with faint nostril slits, and a pair of perky ears, with textured patina in green and brown hues enveloping the equine figure. Zoomorphic representations of this period are generally small in scale, and the figures have simplified schematic shapes as we see here. A wonderful piece indicative of the beginning of Greek figural art when the Hellenistic penchant for naturalism was only in its embryonic stages. Custom museum-quality display stand included. Size: 2.9" W x 2.6" H (7.4 cm x 6.6 cm); 2.875" H (7.3 cm) on included custom stand. The Geometric Period was when many of the trends that would define Classical Greece began: there was an explosion in population leading to the development of proto-urban centers and the construction of monumental temples and sanctuaries; writing, lost after the Mycenaean period, returned to Greece, and along with it came the writing down of The Iliad and The Odyssey for the first time; finally, much of the artwork of the period depicts scenes of gods that would later become codified as the official Greek state religion. 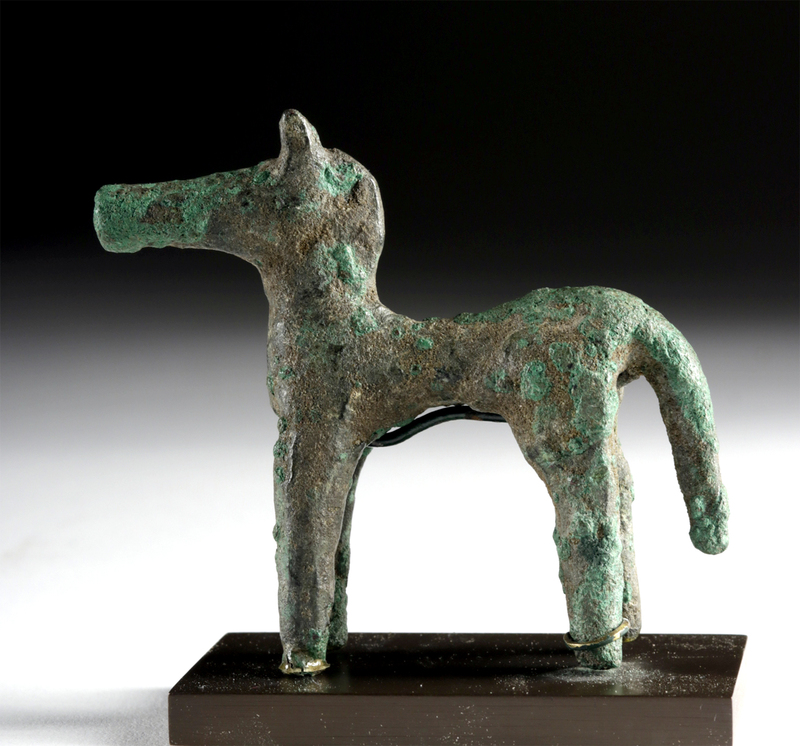 As would be expected in a time period that in retrospect seems obsessed with epic themes, horses, chariots, and warriors were the most commonly depicted things in Geometric Period art. Provenance: private East Coast, USA collection, acquired from Arte Primitivo Gallery, New York, New York, USA in 2015; ex-Edward Safani collection, New York, New York, USA, acquired around 1975; ex-Gilbert E. Bursley collection, Michigan and Florida, USA (Mr. Bursley was a military attache in Turkey from 1947 to 1950). Condition: Repair to one back leg and lower half of tail. Slight bending to body and some legs, minor abrasions to body and head, with light encrustations, and softening to some finer details. Nice earthen deposits as well as fabulous brown and green patina throughout.